We went out last Sunday even if we already watched a movie the day before simply because we had nothing better to do. The little boy was also itching to play at Timezone. After using up his Php100 game card, we headed straight to Mesa Filipino Moderne to have an early dinner. I celebrated my birthday here two years ago, and we didn’t forget its cozy, relaxing ambiance and sumptuous foods. We would have wanted to try their Drunken Ostrich, but according to the waiting staff, they weren’t serving ostrich dishes on that day because the price of ostrich meat has gone up. We settled for Pinatayong Manok and Binagoongang Baboy ni Kaka instead. 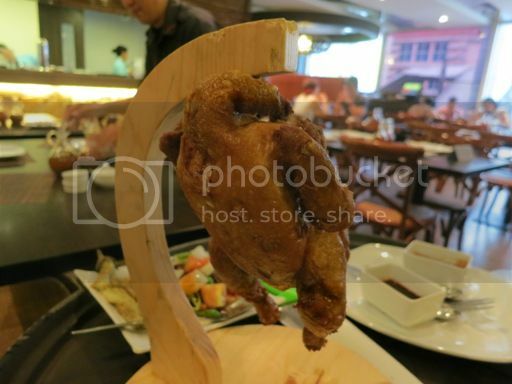 The chicken is literally standing, which is why it’s called “Pinatayong Manok.” It’s a “standing” crispy whole chicken carved right at your table. I liked the name and the taste, but I didn’t notice the crispiness. I also enjoyed the slightly sweet sauce that enhanced this already tasty dish. This is pan-fried pork belly sautéed in bagoong (shrimp paste) with grilled eggplant. This was delicious, too! Because it’s fried, there’s a crunch in every bite of pork meat, which made it fun to eat. The sweet and salty balance of the shrimp paste made this pork dish really palatable, too. I also enjoyed the veggies (grilled eggplant and fresh tomatoes, onions and chili peppers). It was a satisfying dinner! I’ll never get tired of going back here because the place is nice, the waiting staff are courteous and friendly, and the food is delicious. 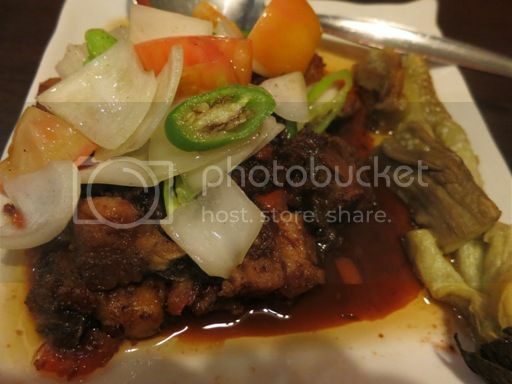 This entry was posted in Filipino Cuisine, Food Friday, Food Trip Friday, Mesa Filipino Moderne, Restaurant Review, SM Megamall. Bookmark the permalink. That a good dining experience. I also like to try it with my family. I read a lot of good reviews about Mesa. I think one branch of this is owned by the family of the Megastar. WOW! ang saya naman ng Pinatayong Manok! Nakasabit! i love mesa!!! in our work we always bring clients to mesa cause they love the food there!!! wahahha. that is so cool. pinatayo talaga. do they only have this in Megamall? looks very yummy dear! now lng ako nkarinig ng pinatayung manok hehe craving it now! Finally, a new place to try! Thanks for this. Mukhang very tasty yung chicken! One thing I miss in Pinas is the kind of food you can eat in the restos. It looks yummy. I like to eat and try new food every now and then. wow! so cute naman ang presentation ng ‘pinatayong manok’. Oks na sana buty you told you never noticed its crispiness. Nevertheless, I love to try it. The thing where they put the chicken, due to it’s menu’s name of pinatayong manok reminds me of the same exact thing where we put our bananas… looks good and definitely hopefully visit that place someday. Yummy! I want the pork with salted shrimp fry. I miss it! First time I’ve heard of pinatayong manok. 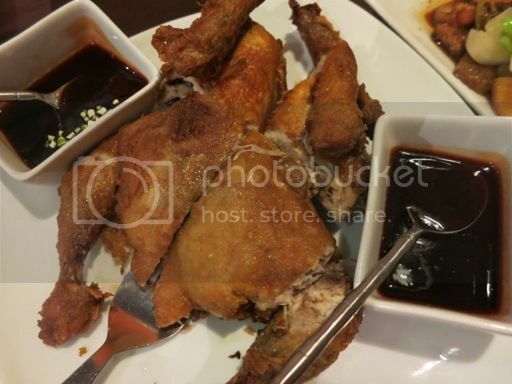 Only pinaupong manok was familiar to me till I came across this divine review. Looks like a glorious dining experience for you and your family.